� Fopma ranked in the top 11 on the AVP Tour in blocks per game for four straight years (2006-2009). � Fopma had advanced from 14 of the last 15 AVP qualifiers she had played in. � In 2013 Fopma was eliminated from an FIVB event five times by another American team. � Fopma notched her first AVP win in 2013 in Huntington Beach with Brooke Sweat. The duo lost their first round match, then won six straight matches, including five against teams seeded 10 or higher and one in the rematch against the team which defeated them in the first round. 2014: Fopma began a new partnership with Whitney Pavlik. On the AVP the duo played twice, with a best of third place, before Fopma was sidelined with an injury. On the FIVB Tour they played seven times, with a best of ninth twice. 2013: Fopma and Sweat were the second-ranked team on tour after advancing to four semifinals in seven events. The duo fared especially well in the California events, placing second in Manhattan Beach and Santa Barbara before winning the season finale in Huntington Beach. Fopma led the Tour in blocks (1.18 per game). Fopma and Sweat played 10 tournaments on the FIVB Tour, and advanced from the qualifier in four of five tries. Their best finish was a bronze medal, Fopma's first on the FIVB, and they placed 17th in the World Championships in Poland. 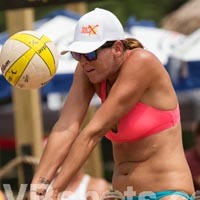 Fopma played the FIVB season finale with April Ross, placing ninth. 2012: Fopma formed a partnership with Brooke Sweat, starting the year with a win in a USA Volleyball IDQ event. The duo had a pair of thirds in the two AVP events, while on the Cuervo Tour they had one win, two seconds and three thirds. Internationally they played in two FIVB tournaments with a best of 25th, and garnered a seventh in an FIVB Challenger as well. 2011: Fopma reunited with Hochevar to compete internationally, having to play in the country quota in all three events they competed in. The duo improved from a loss in the country quota to the qualifier to a 17th. Domestically Fopma played with Tracy Jones in seven events on three different tours, with two second-place finishes and three thirds. She also played twice domestically with Jessica Gysin. 2010: Fopma played the first two AVP events with Whitney Pavlik, with a best of ninth. She then began a partnership with Keao Burdine, getting a best of ninth in their five AVP events together. 2009: Fopma continued her partnership with Hochevar, logging 12 top-10 finishes in 14 AVP events. In Brooklyn the pair won three straight contender's matches to advance to the finals, the first for both players. The duo ended the season as the eighth-ranked team in season points. 2008: Fopma began a partnership with Jenny Pavley, finishing seventh in the season opener. After seven tournaments the pair split, and Fopma played once with Jenelle Koester. She then paired with Brittany Hochevar for the remainder of the season, with a best of seventh. Fopma was sixth in blocks per game (.91). 2007: Fopma played the first five events with Rouwenhorst, with a best of 13th, before playing four times with another Pepperdine alum, Julie Romias. The last seven tournaments were played alongside three different partners, including three times with Holly McPeak. With McPeak they improved from 13th to ninth to third as Fopma made her first semifinal in the season finale in Mason. Fopma ended the year fourth in blocks per game (1.14). 2006: She again played the entire season with Rouwenhorst, playing in 14 events. They advanced from the qualifier in eight of nine tournaments, capped off by the Manhattan Beach Open, while being seeded directly into the main draw in the others. The duo had a career best ninth-place finish in Manhattan Beach, the first of four straight ninth-place finishes to close the year. 2005: Fopma began her pro beach career playing with high school and college teammate Stacy Rouwenhorst, competing in 10 tournaments. The duo advanced from the qualification tournament four times, including the last three of the year, one of which was the Manhattan Beach Open. College: Fopma began her career at Pepperdine, then transferred to Cal State-Northridge. At Pepperdine she was named second-team all-West Coast Conference and left as the school's all-time leader in hitting percentage and fifth in blocks per game. In her one season at Northridge, she was a first-team all-Big West selection and a third-team All-American, becoming the first Division I All-American in CSUN's history. She helped both Pepperdine and CSUN to the NCAA Tournament and was named All-Region with both teams. Personal: Fopma was born in Leiden, Holland, as her family was there due to her father playing professional basketball there. Both of her parents were from California originally, and the family moved to California when Fopma was one year old so that she and her older brother could start school in the U.S. A long-time friend of former partner Stacy Rouwenhorst, both went to the same high school.